Thanks to this blog and several knitters who have a sense of true value, I seem to be attracting Beverly Royce artifacts. Last month, after a brief email exchange, I found an intriguing and very special package in my mailbox – letters, notes, fiber, yarn and knitting! Margit J. of Minnesota ran across my post about Beverly, and since she was doing some cleaning and sorting, offered me the bag of items she had so carefully kept. Margit had attended Knitters’ Camp in the early 80’s, where she met Beverly (not to mention Elizabeth Zimmermann and Meg Swansen). 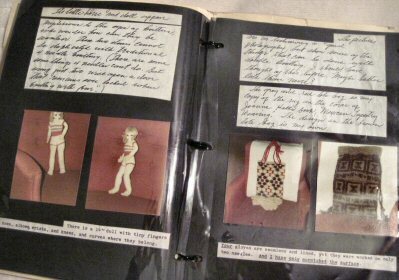 The samples and letters from Beverly had been sent to a Minnesota yarn shop owner, had been passed along to a mutual friend, then on to Margit. 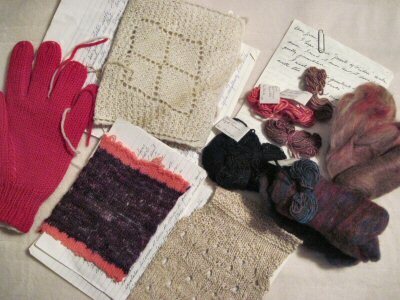 And now, these treasures of knitting history have joined my own little collection of samples! The wonderful thing about this group is that we not only see the products of Beverly’s knitting and spinning skill, but have her own description of what she did, how she did it, and what she was thinking. Simply fascinating. I’ll be writing more about this soon, but as a teaser, I thought I’d share some previews. Thank you again, Margit!